Everything starts with the coming for Portugal of Master Mitsuharu Tsuchyia 3rd Dan of Nippon Kenpo, were we in 17 of May of 1975. It established the School of Budo in Sapadores at Lisbon and he invited some Japanese masters of other styles such as: Shorinji-Kenpo, Judo, Aikido, Kendo and Iaido, where they divulged its arts in set with the Nippon-Kenpo there, all joined by the same spirit of Budo. 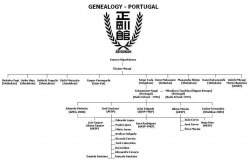 At this time the situation in Portugal was complicated at several levels. Although thus, he still invited Master Katsumune Nagai, 4rd Dan of Goju-Ryu, pupil of Grand Master Seigo Tada and Champion for four times in the Championships of the Seigokan, that arrived Portugal in 2 of October of 1976. It created thus a strong school with about 60 pupils, where some pupils, trained by Master Katsumune Nagai stand out and had known together, Eduardo Pinheiro, José Santana, João Salgado and Altino Morais, among others, that for several reasons had been leaving to train or to belong to Seigokan. The trains were well guided, with forged character by arduous sessions. All the styles lived in set and in respect it stops with the some existing Martial Arts in the School of Budo. After some years, they had decided to close the School of Budo and each art followed its route individually. In 1978 we create the Portugal Seigokan Nagai-Kai Association, in homage to Nagai master. In 1979 the Nagai master for familiar reasons, had to return definitively to Japan and wanted then to leave in Portugal the first black belt 1st Dan and the chosen one was Eduardo Pinheiro. We legalize the Association next to the CDAM - Martial Arts Enliven Commission, under the court of appeals of the Ministry of the Army. In this period Dojos in activity had two, the Dojo of Encarnação and the Dojo of Arroios, come this to lock up for other people's reasons to the practical one of the Karate, being only of the Encarnação. In 1980 we open the Dojo of Alcântara and we changed the name of the Association, for the existing one still today in Portugal, Association of Karate-do Seigokan of Portugal (AKSP) for a question of uniformity of criteria, having in account the name of the associations in the other Countries. In September of 1981, at that time the average of age of the pupils was 20 years, and that would go up to around the 40 pupils, Eduardo Pinheiro decided to close the only Dojo in activity, of the Encarnação, this time for reasons of superior order, to fulfil its service Military. All the pupils, with some frustration had been without being able to train and to develop the Goju-Ryu Seigokan. In its majority, these pupils had followed other styles, or even though they had never more trained or come back to enter in contact with the Seigokan. In 1983 we returned in congregating with some more believing and capable pupils for the success. 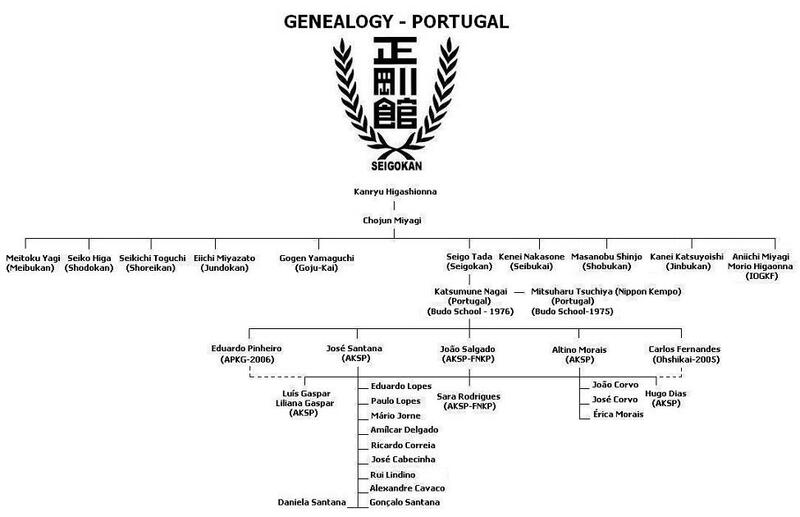 Of the Seigokan in Portugal, its names are the following ones: Eduardo Pinheiro, José Santana, João Salgado, Carlos Fernandes and Altino Morais. They had confided the Dojos of Campo de Flores - Lazarim and reopened the Dojo of Alcântara, where during this period we received sporadically visits from Nagai master. In October of 1986, Eduardo Pinheiro and José Santana went for the first time to Japan, with the objective respectively to make examinations of graduation for second Dan and first Dan, objective this obtained fully, after a period of training in diverse Dojos always controlled by Grand Master Seigo Tada. Still in this year, they had been created the Dojos of Queluz and Queluz de Baixo, which had been guided for Eduardo Pinheiro, and those of Charneca de Caparica and Lazarim for José Santana. In January of 1987, Grand Master Seigo Tada come the first time to Portugal and graduated for First Dan, João Salgado and Carlos Fernandes. Still in this exactly year, the Dojo of Moscavide confided. In 1989 we made another invitation to Grand Master Seigo Tada to come to Portugal to know the pupils and guiding a period of training of one week, what it readily acceded with all the will. Examinations of graduation for third Dan to Eduardo Pinheiro and second Dan to José Santana had been effectuated. In 1991 the level of first Dan was attributed to Altino Morais by Eduardo Pinheiro, having these abilities to make it, since he was the National Technical Director at that time. In 1992 José Santana made a visit and a period of training in Macao where he trained with some Masters of the A.K.S.M - Association of Karate-do of Macao, and was advised for masters of Macao to pass for Japan and to make its examination of Graduation for third Dan, where it found with Master Yoki and Master Nagai. In September of 1993 Eduardo Pinheiro one more time, and of this, for professional reasons, that they hindered it to be with regularity to the front of the Seigokan, abdicated of its statute of National Technical Director passing this, for José Santana, position that he still withholds in the present. In this exactly year, the Dojo of Queluz de Baixo passed to be guided by Altino Morais, after beeing a few years guided by João Salgado. In 1 of March of 1996 we finally obtain the register to A.K.S.P. in the 23rd Notary's Office of Lisbon, being Eduardo Pinheiro without training during the period of five year, possessing currently the graduation of 3rd Dan. In 1997 Altino Morais obtain the level of second Dan for the National Technical Direction of A.K.S.P. In this exactly year, Eduardo Pinheiro came back to the Seigokan, after having decided its professional situation and created the Dojo of Torres Vedras. Still in this year, in November, Portugal was set appointments to a visit of the Grand Master Seigo Tada, that became to died in the 18 of September. In July of 1998 José Santana and Carlos Fernandes had dislocated to Japan in order to participate in the 53rd Anniversary and Championship of the Seigokan. They had had a honour participation for the fact of José Santana wins the first place of Kumite and second place of Kata. After the championship had been effectuates examinations of graduation for fourth Dan and third Dan respectively. In March of 2001 Altino Morais was responsible for the Dojo of Moscavide. In November of the same year, Eduardo Pinheiro one more time abandons the Seigokan, this time for not having been accepted its impositions among the A.K.S.P. In December of 2002, with the knowledge of Mrs.Tada we receive the visit from Master K. Takazaki (8th Dan) and Seigokan Overseas Head Director at that time, that was between us during one week, where we organized a period of training guided for Takazaki Master, on which had followed examinations of graduation of some Dans, where inclusively Altino Morais made its examination for third Dan. In July of 2004 José Santana with more a train of the Seigokan of Portugal it participates in the 59th Anniversary and World-wide Championship of the Seigokan and for the second time it obtains the champion heading, of that much in is proud them and honours, having effectuated its examination for 5º Dan. In December of 2005 some members of the A.K.S.P. leave to belong to the Directory for incompatibility of ideas and respect lack stops with the superiors, case of: João Salgado in Japan and Carlos Fernandes in Portugal. After a short period of time, João Salgado returns, but Carlos Fernandes (4th Dan), after thirty years training Goju-Ryu Seigokan, joined the Ohshikai organization, recently created by Kiyotaka Takazaki, that meanwhile left Seigokan. Every year we organize one kangeiko between all the Dojos, periods of training and Championships of the Seigokan, organized by the A.K.S.P. Already we had honours participation in Regional and National championships organized by the National Federation of Karate-Portugal, Cup of Portugal, among others identities, etc. In June of 2006, José Santana and Altino Morais had organized the XXVIII of Seigokan Championship with the participation of 206 pupils in its totality. José Santana - 150 pupils. Altino Morais - 30 pupils. Luís Gaspar - 20 pupils. Eduardo Pinheiro - 6 pupils. José Santana has 10 dojos - 300 students. Altino Morais has 2 dojos - 70 students. Luis Gaspar has 1 dojo - 30 students. Eduardo Pinheiro has 1 dojo - 30 students. In December of 2006, once more, Eduardo Pinheiro left AKSP to create his own Association (APSN) with his Academy (APKG), after being nominated to assume the position of AKSP President. We are in the AKSP since 1976 at the good and bad moments, we have led and structuralized the AKSP by pulse, step by step, with very work and many difficulties, always of good faith and with much pride for the done work. It is with naturalness that we admit our errors, but always with the mind in the future of the Seigokan in Portugal. 1922 Born on February 18th in Kyoto, Japan. 1937 Learned Chinese martial art (Chinese Kenpo) from Mr. Ching Lou. 1939 Entered Karate Club of Ritsumeikan University. Studied with Mr. Chojun Miyagi, founder of Goju-ryu. Became Supervisor of Karate Club of Ritsumeikan University. 1945 Established Nihon Goju-ryu Karate Doshikai, Nihon Seigokan Karate Doshikai, and Nihon Seigokan In Kyoto City. He instituted training of wholesome hearts and bodies, the education and popularization of legitimate karate-do for young men and women in each area. He lead 120 Seigokan branches of 10 Karate Clubs (Osaka, University, Shiga University, Bukkyo University, Osaka Dental College, Kyoto Foreign Language College, Kyoto Institute of Technology and Textile, Kyoto Pharmaceutical College, Yamaguchi University, Tokuyama University, and Kyushu Kyoritsu University) , Karate Clubs of many enterprises, and 20 Overseas branches of Seigokan as President and Chief instructor. The number of Seigokan members is over 200,000 now. 1964 Helped establish All Japan Karate-do League, Karate-do Federation of Kansai District, Karate-do Federation of Kinki District and organized metropolitan prefectures Karate-do League as a promoter and executive. Pushed on with the administration to support Union of each group of Karate-do. Tried for establishment of rules and competition and developed protectors originally (1952). Promoted All Japan Tournament, International Tournament, Japan National Tournament, joining Olympics as well as Tournament with protectors. Career Member of Central Leading Council in all Japan Karate-do. In international activities, he established Seigokan in Hong Kong and Macau in 1967 to promote understanding and popularization of Karate-do in foreign countries as well as affiliation in the Olympic games. Since then he has visited England, USA, Brazil, Australia, Italy, Portugal, Finland, West Germany, Singapore, Philippines and other countries to lead and educate instructors. Received prize for athletic merits in 1981. He was handsome, active and young all the time. 1997 September 18th - Seigo Tada, Chairman and Founder of the SeigoKan, at one time the largest Goju-ryu Organization in Japan dies in Himeji, Japan, at the Honbu Dojo by an heart attack. His wife, Mrs Okamoto Michiko (Seigo Tada II) and now Sandaime Kancho (Seigo Tada III) continues his efforts of SeigoKan Goju-ryu in Japan and all over the world.